With summer being right around the corner for me it's time to start thinking about ways to protect my family. Not just in the way of sunscreen like you're probably thinking, but also hydration. Many probably don't think twice about it, but having two kids and a husband that all like to do things outdoors I think about it alot. Due to the medications my husband is on he has to be really careful to make sure he stays hydrated properly. Otherwise it means dizzy spells and feeling really sick. Trust me that's no fun when it happens. The first few times it landed us in the urgent care office because we thought there was something really wrong. Come to find out his electrolytes were just really low. Thankfully now we know the signs and how to make sure it doesn't happen again. Dehydration is one of those things that doesn't just target one age group, it's can affect everyone out there. It especially has harsher effects on those that have other conditions that cause them to become dehydrated faster than others, like my husband. But thankfully there are ways to keep yourself properly hydrated. And even for those times when you forget to make sure you're on top of it ways to help re-hydrate your body faster. One of those ways is by using DripDrop in your water. It's an Oral Rehydration Solution that through being mixed in with your water will provide you with 3X the electrolytes. Those are what help helps to re-hydrate your body and get it back to where it belongs. My favorite part about DripDrop is that it comes in tasty flavors and doesn't make me want to gag when I drink it. Plus it doesn't taste like pure sugar either like some of the sports drinks on the market that are supposed to help hydrate you. I can keep a few of them in the glove box of my car, my gym bag, and even my purse so it's always there in case I need it too. DripDrop is flavorful powder stick that when mixed with water, acts like a liquid IV! This Oral Rehydration Solution (ORS) has 3X the electrolytes and ½ the sugar of sports drinks. It’s proven to be 34% more effective than water in re-hydrating a body. They come in individual packets in yummy lemon and berry flavors, perfect for on-the-go. What’s more, it’s even created by a doctor! 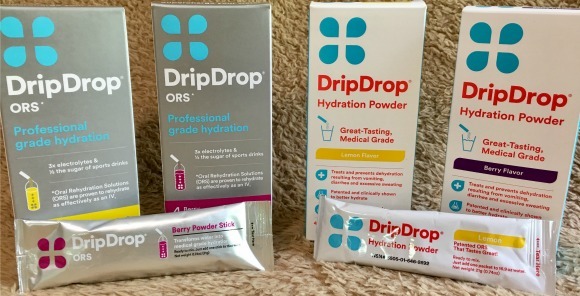 Win it: One lucky reader will win 2 boxes of DripDrop. This giveaway will end June 21st at 11:59 PM EST. The winner will have 24 hours to respond to my email. If no response, a new winner will be chosen. Prize fulfillment will be made by the sponsor, I am not responsible for prize delivery or lost or stolen deliveries. Open to residents of the US. I keep cold water in the frif which has been filtered. I also keep a large supply of water bottles available. Then when the kids are outside playing I make sure to keep them supplied with water. We always have water on hand, whether we are home or traveling. We plan ahead and have it so we stay hydrated! I discovered drip drop last summer and LOVED it! We drink it and water to stay hydrated. I always carry a water bottle with me. We always have a water bottle with some extras in the cooler. We keep plenty of filtered water with us. As the weather gets warmer, we also keep water bottles filled 1/3 of the way in the freezer so as we leave, we can fill them and the ice helps keep them colder longer! We always carry water with us. We always have water on hand. We always carry bottled water around with us.